Have you ever been frustrated over the lack of success in your network marketing business? And still nothing to show for it? Are you thinking of quitting before you really get started? Are your dreams of achieving financial freedom slipping away? Network Marketing can be challenging when you try to go it alone. It takes more than passion and enthusiasm to begin or grow a network marketing company. To succeed in network marketing you must have a personalized step-by-step system to help you achieve your goals. Learning the skill sets required to make this a highly successful home-based business will take some time, but you can shorten the learning curve by following in the footsteps of experts who have already achieved high levels of success in the network marketing industry. The Network Marketing Dreamteam, faculty for Networking Times University, includes three power-house women who have changed their own lives plus the future of their families due to the massive success they created through network marketing. What makes this dynamic team so unique is that they chose a specific business model that was easy to start, allowed them to work part time and still achieve fast results. These network marketing success experts now share their passion to help other women achieve the same fast-paced level of success and financial freedom. The proven system laid out in their Master Class plus personalized coaching and accountability will help you to achieve your success goals faster in any network marketing business. Their desire is to help you create the success and dream life you desire in record time. Together they have over 15 years experience in network marketing success. 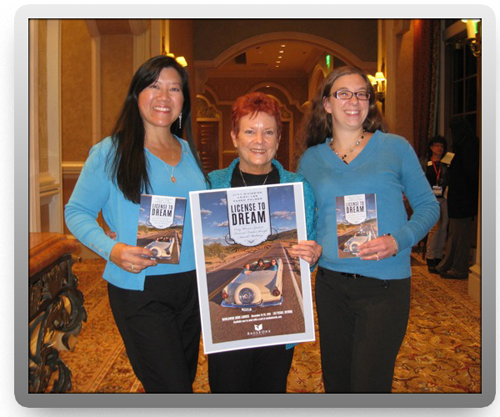 They wrote the book License to Dream on home based business success for women outlining the specific benefits of following the road to financial freedom and all the pieces that go into a successful network marketing business. They also include a special section on the specific pitfalls that tend to sabotage women and have coached dozens of women on the steps to success that are spelled out in their Master Course. To See what others have to say about Judy, Kristi and Karen- see our “TESTIMONIALS” Page. Take the first step today to a better future for you and your family. Get your FREE report NOW at helpwomensucceed.com. If you have struggled with making your network marketing business work, let the DreamTeam help you get on the road to Financial Freedom and Massive Success. Don’t wait any longer to reach your Dreams – join us!